What an amazing pattern of the blog-post! I love-love it this way! It was nice of the salamander to share his thoughts with us! Thanks Dawn. Yes it was very nice of him/her. Salamanders are not as shy as one would imagine. Now I just hope that he (or she?) will find a deeper digs so that he can save up all his strength for the serious business of finding a mate in spring! I hope deeper digs have been found too Reggie. It’s become a lot colder the past couple of days. I can’t imagine anything cold-blooded surviving above the ground at even a couple of degrees below freezing. This guy is going to be in high demand on the nature talk show. His answers are very clear and informative. Ms. Doolittle doesn’t do half badly as an interviewer as well – they may want to hire you full time, but you’ll be torn as the film crew may be demanding you join them instead. Thank you Cindy 🙂 I’m glad I was able to make the most of such a chance encounter. Hope you got his name so you can look him up after the mating season. Would like to hear all about his family. Scott, I’ll bet he’ll/she’ll be keeping a low profile as soon in the spring and summer. There would be more predators on the prowl then and he/she would look pretty scrumptious to a mother bird with a nest full of chicks to feed. 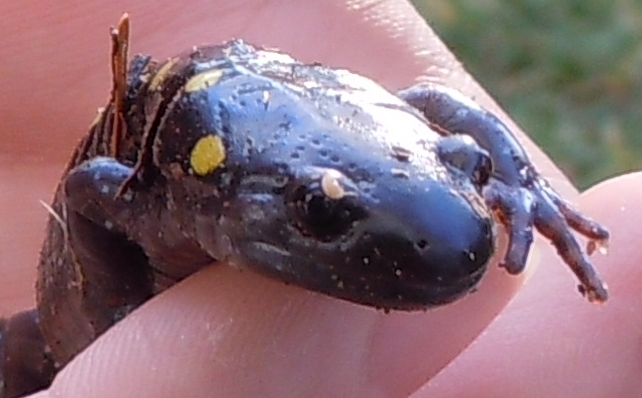 Does this salamander have insomnia? As long as he was awake, I’m glad you spotted him. 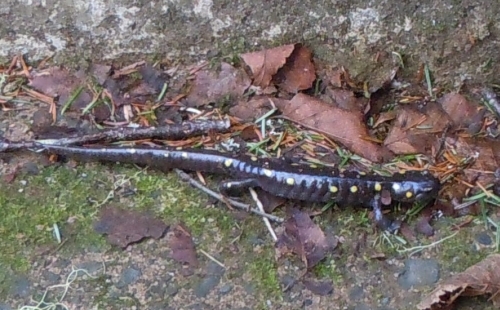 Pamela, this type of salamander is supposed to be nocturnal so it’s even odder to have seen one out and about during daylight hours. Maybe he/she was sleepwalking. The world is so full of a number of things . . .
Gerry, not too solitary indeed. I’ve seen quite a few of the red-backed ones in pairs under rocks. As for growing up with all those siblings… I can just imagine. Congratulations on your marvellous interview with the two-legger. 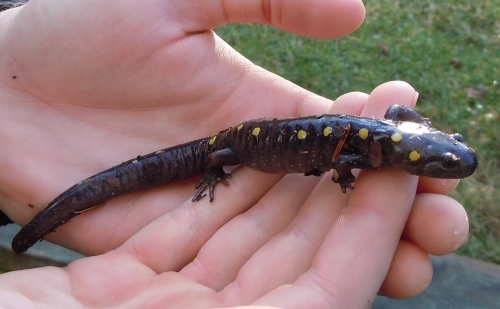 You are a large handsome / lovely salamander. How lucky you were to find a two-legger who spoke salamander and was able to bring your words and the lovely photos to us. Perhaps I’ll see you or your off spring in the spring.